We pulled away from Park Sierra on Wednesday, May 26, and began our 7-day journey to Nacogdoches,TX where Xtreme Paint & Graphics will fix our slide room problem, paint the roof with a non-skid urethane finish, install new outside mirrors and swap out the old and uncomfortable driver and front passenger sets for new ones. When that is competed we’ll drive over to Motorhomes of Texas for some routine maintenance and to check the small leak in the radiator. This is not the kind of traveling we like to do. We have almost 1800 miles to cover and we have to be in Texas on Tuesday, June 1. It is get up early and get on the road before traffic builds. Pull over for a quick lunch alongside of the road and then keep on moving. If Trixie was confused in the past about where she is at, she will be totally lost by the first of June. The first day we drove to Bakersfield, CA and “camped” overnight in the lot of Cummins West. The next day Cummins fixed a leak in the line to the fuel filter, changed the oil (40 quarts) and lubricated the chassis. We were out of there at 12:30 and then drove 330 miles to Kingman, AZ and pulled into the perfect spot at Camp Wal-Mart at 6:30. I went in to the courtesy desk to ask if we could park overnight on the perimeter of their huge parking lot. I was told that it was O.K. with the store, but the town might object. The lady behind the service counter quickly added that no one had ever been asked to leave. There were at least five other RVs in the lot. Friday we departed from the Wal-Mart parking lot in Kingman at 7:00 a.m. and headed toward Winslow, Arizona. (If Winslow, AZ sounds familiar it might because of a song by The Eagles.) We drove about 220 miles and pulled into the Wal*Mart Super Center early in the afternoon. Saturday we got up a little later, but were out of the parking lot at 7:45 and headed toward Albuquerque, NM. We arrived at 12:30 only to find that our rig is way too big to get into the parking lot so we took a road that ran in back of the store and found a nice private school with lots of parking area and so we camped there. We covered about 300 miles. Along the way, we experienced another problem with the coach. About 150 miles west of Albuquerque our CHECK ENGINE light came on. We pulled over right away and looked for obvious signs of trouble, but found nothing. Next, we called Gary Omel, who is a former Foretravel factory technician, a former over-the-road truck driver and the kind of guy who has forgotten more about diesel engines, trucks and things mechanical than most people will ever know. And he loves to solve problems. Gary had us do a few things. Because we have specialty software called VMSpc we have instantaneous information about what is going on with our engine. We monitor: engine temperature, oil pressure, engine load, battery strength, transmission temperature, fuel consumed and a few other items all displayed on my laptop. We could monitor more functions, but frankly would not know what to do with the information. So, with all of this information, Gary was able to determine that we are not in a situation that could lead to engine failure and that we can safely proceed to Nacogdoches with a watchful eye on engine temperature and oil pressure. And listen to the ding, ding of the warning tone for 800 more miles. In two more days we will say goodbye to this beautiful park and to this beautiful area. Saturday morning we said goodbye to the Hatfields: Pat, George and Cosmo. But before we parted, Sandy and I along with George Hatfield took one more trip into Yosemite. 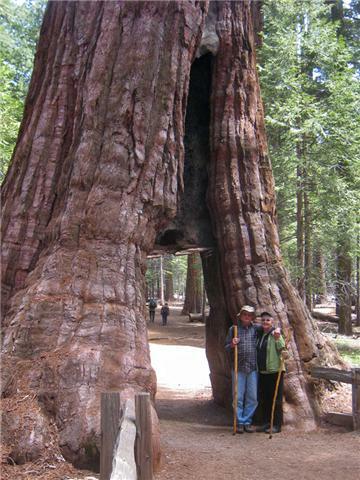 We got real lucky because the park had just opened the road back into the Mariposa Sequoia Grove. That saved us a round trip of 4 miles just to reach the grove. So instead we used our energy to hike 1.6 miles back into the grove for some close ups of these magnificent trees which are among the largest individual living organisms in the world. My thanks to George Hatfield who took these photos. It was another beautiful spring day; even at 6600 feet of elevation where snow still lingers. 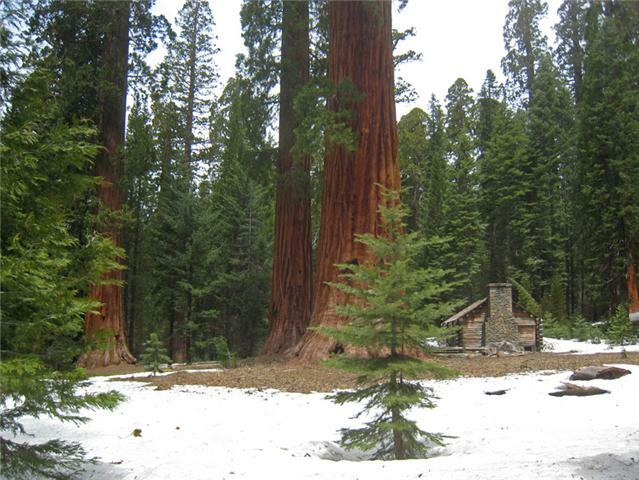 The little cabin to the right of the Sequoia gives you some idea of the size of these magnificent trees. One attraction we did get to see is this Sequoia that has a walkway cut through the base. Fortunately, the tree has survived and this type of disfigurement of trees is no longer possible. One last look at a panorama of the park. and have no green coloration. 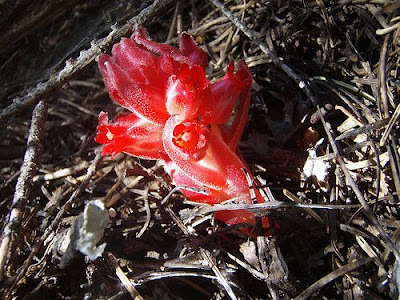 The ones we saw had not fully bloomed, so I borrowed this one from Google Images. We leave here Wednesday for a 1757 mile trip to Nacogdoches. More on that later. Some of our RV friends who like dogs, but don't have one, will often write about how they get their "doggie fix" by spending time with someone else's pooch. Yesterday we had a house guest named Cosmo. Cosmo's "parents" George & Pat Hatfield were in Yosemite with family and we jumped at the chance to have a playmate for Trixie. She didn't do much playing, but we had a ball with Cosmo. He is playful and very affectionate. His choice on spots for a nap is alongside of someone or on their lap. You might say: we lapped it up. We invited him back today and he is presently snuggling up to Sandy's pillow. My lap was occupied by my laptop. Some of our readers often ask me nuts and bolts type questions about our life style. Today I’ll provide more information about this Escapees Park where we are guests. and machine needed for wood and metal work. the storage of used oil. The park buys propane in bulk for resale to members. SKP Park of the Sierras, Inc. is a nonprofit mutual benefit corporation organized under the Nonprofit Mutual Benefit Corporation Law. Each of the 250 individual sites sells for $16,000. Members signify their intent to buy by placing a $1020 deposit and signing the necessary documents. At present there are about 50 people on the waiting list but it is anticipated that everyone on the list will be offered a site within the next six months. This rapid turnover is due to an unusually high number of founders who are now in their early 80s and are moving on to other living arrangements. Escapee members who decide not to take a site will receive all but $20 of their $1020 deposit. When a member moves out of the park, the original selling price of $16,000 is returned. Last year every site owner received a $200 payment that represented their share of income from rental sites – such as the one we are in and pay only $295 a month, plus electric. As a comparison, renting in a private RV park such as this would be a minimum of $600 to $700 per month. storage tanks and pump house. The current monthly assessment is $100 plus electric. The park operates its own water wells and distribution system, the electric distribution network, wi-fi and cable TV and has its own telephone system. The entire park contains 151 acres, of which 40 will never be developed. Inasmuch as the organization is a co-op all members are expected to contribute to the upkeep of the park as best as they can. This can include painting and repairs, cleaning, tree trimming, landscaping, and much more. For the less physically robust, there are such tasks as weeding, taking periodic water samples from each site or emptying coins from the laundry machines and putting the coins into paper tubes. Seniors requiring daily assistance with living can move into the CARE facility at the Escapees Park in Livingston, TX. So as you can see, being an Escapee has a lot more benefits than a decal in the RV window. Here is what we see from the front of our coach. Sandy reminded me that I have not taken many photos to show you around this scenic park. 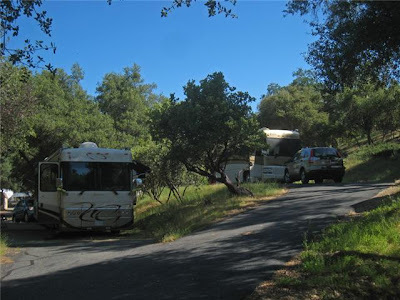 There are about 250 sites here for motorhomes, 5th wheels and travel trailers. Some sites are heavily improved with decks and flower gardens and I even saw a hot tub. And other sites are almost neglected. I did not take any pictures of those. So here are some views of where we are living until May 26. 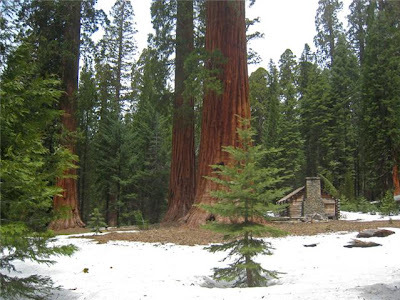 Tomorrow I will show additional park pictures and describe more about the organization and what it takes to own a site here in Park of the Sierras in Coarsegold, CA. A few things that are left over from other blogs. Everywhere we look we see the California Poppy. We are located in the heart of gold mining territory and some of the nearby towns have a colorful history. Shown above is picturesque Mariposa -- one of the more interesting places to visit. They have a museum that is a treasure trove of really neat stuff. Sandy and I enjoyed reading pages from a gold miner's diary that were scattered throughout the museum. It was a tough life back then. Unfortunately, they do not permit photos to be taken inside of the museum. There are also several excellent restaurants in town. We had lunch at The Butterfly Cafe and plan to go back. Everything was fresh and delicious. The chocolate brownie cake was spectacular. On the subject of food, we found a bakery that specializes in pies, breads and cinammon raisin muffins that are almost as good as those made by Sandy. We bought a Dutch Apple pie that was, without a doubt, the best pie either of us has even eaten from a commercial establishment. I guess if we have to go back to The Butterfly Cafe, we'll just have to go back to Jantz Bakery. Thursday night we went to dinner with neighbors Barb and John Schrand who have spent the the greater part of the last 7 of the years in their beautiful Alfa along with Toby, their Shiba Inu. We had a good time learning about how each other came to the decision to live in an RV. John and Barb used to live in Sugar Grove, IL. They are here throughout the weekend. Tonight was cocktail hour at the clubhouse. Sandy made two plates of snacks and we took along our drink of choice: a margaritta for me and a Pina Colada for Sandy. Mmmm, mmmm GOOD. You can tell from the above photo what a miserable time we were having. The members we have met are very warm and welcoming and we enjoyed ourselves while at the clubhouse. Few words. Mostly pictures. Beautiful day. But like everything else in life, there were tradeoffs. For me I had to give up some favorite possessions and sell some useful tools. Shedding those tools was actually not that difficult because in a motorhome they would be of little use. Where would I put a Bosch work site table saw, anyway? Sandy and I live a simpler lifestyle. The only possessions we own are those we really need. No more full storage barn or basement storage room. The biggest adjustment was moving further away from children. We aren’t the kind of family that practically lives under one roof, but we got together often and always enjoyed our times together. Being somewhat handy with tools, I was also available for hands-on support and advice. And now that Jennifer and Brad are homeowners, I wish I had been able to help them with painting, repairs and/or renovations as I know they would have liked. But I am still available for advice. Then there was the issue of selling a home in a downward spiraling housing market. For the past 15 years, every nail I pounded, every paint brush stroke I made, every bush and tree we planted and every improvement we made was done with two goals: 1) to make our home more enjoyable and 2) to increase the resale value. We succeeded on point 1 and lost out on #2. We saw neighbors whose homes had no appeal, few upgrades and no quality sell for outlandish high prices just a few years before we decided to sell. There is the marketing truth that homes usually sell for just what they are worth. Selling ours for what felt like a lot less than it was worth was the hardest adjustment I had to make. But I am finally over that. Sandy and I have revisited this topic often in the past eight months, but less more recently. We understand that had we stuck around and waited for a better price or a more appreciative buyer that we would have had to sell for even less. And in that time, we would have had to defer our Great Adventure. We made other adjustments. We don’t have the comfort level of great medical/dental care three miles away. We don’t have Kojak’s French fries on Saturdays, we don’t get to see a few good old friends, but we are making new ones. For me there were a few other comfort factors I had to relinquish. I had finally learned all the surrounding country roads and could circumvent almost any traffic problem. This knowledge of the countryside gave me a sense of belonging. In addition, I had made a lot of casual friendships with people who worked at local businesses and I enjoyed talking with them in the course of using their businesses. I had a part-time job where I had an important and appreciated role in that company’s growth and its respect in the community. As part of that job I met many area residents and formed friendships with them. All of these are some of the touchstones in life that help cement our feelings of belonging in a community. But any negatives from changing our lifestyle and our environment are far outweighed by the positives of seeing so many beautiful places and, when we get bored, we move on. We do get to meet new and interesting people; and when we click, we stay in touch by e-mail and blogs. So, stay tuned as we continue to share our Great Adventure with you. The Escapees here at Park Sierra prepared a nice Sunday dinner in honor of Mother's Day. Several people invited us to attend, but we did not want to be freeloaders. However, when I found out that they needed volunteers to clean up, we signed up -- and then we were able to give something back in exchange for the dinner. The dinner was held in their huge clubhouse. Park Sierra is a co-op with each member buying and owning their site. There are 250 sites and a waiting list for openings. We are not planning to add our names. We have places to go and things to see. On the menu was Caesar salad, home-made sourdough rolls and home-made split pea soup. Dessert was angel food cake with a whipped topping containing pineapple and coconut. It was all very good and our companions at the table were pleasant and hospitable . As I looked around the room filled with at least 250 of my peers with gray hair or no hair, expanding waist lines and gimpy legs, I had a stunning revelation: Holy Crap, I really am getting old. After dinner, Sandy and I bussed tables and then we washed, dried and stacked a whole bunch of serving dishes. The kitchen crew was fun to be with and everyone pitched in and we were done in about one hour. Then we came home and played Scrabble. Pretty good day all the way around.